Frank Straub recently departed the Spokane Police Department under murky circumstances. 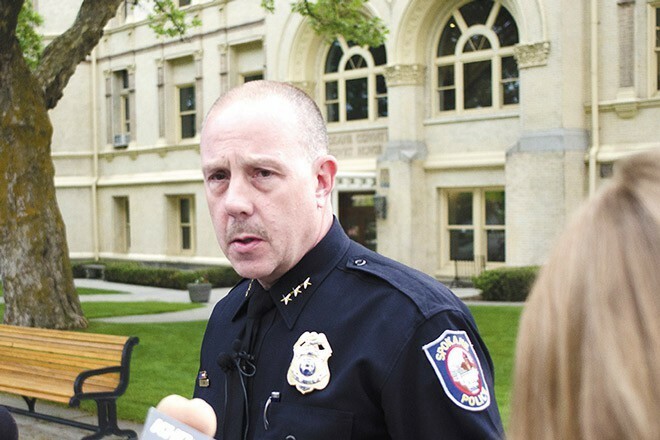 Spokane mayoral candidate Shar Lichty has filed an ethics complaint against two of Mayor David Condon’s cabinet members, alleging they’ve been dishonest in their remarks in the lead up to the ouster of Spokane Police Chief Frank Straub. As reported by the Spokesman-Review, both Coddington and Sanders have given shifting reasons for the departure of former police spokeswoman Monique Cotton and the rationale for Straub’s departure. Sanders initially told the paper that Cotton was given a raise as an “enticement” to move to parks, an answer that turned out to be false, according to the complaint. The complaint lodged against Coddington states that he falsely denied knowing that Straub, who is suing the city, was in danger of losing his job. “I provided the most current information available when I was asked,” Coddington told the Inlander, saying that information was evolving and the city administration did its best to provide the most current. He declined to comment on the complaint, saying he’d let the commission handle it. Lichty admits that filing the complaint was political, but notes that the Ethics Commission will respond to the complaint in 30 days, after the election.